The adorable little rattles come in either a gentle giraffe or a snuggly sheep. 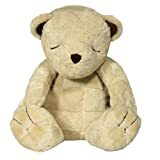 Cute and cuddly, perfect as an add-on gift for babies. NOTE: This item does NOT include the burp cloths. Made using eco-friendly Soy fibers, Polar Cuddle Cub?? ?s soft shivers create a nurturing tactile sensations that warms the heart and calms the senses. Polar Cuddle Cub?? ?s soft and unique rhythmic vibrations will soothe and comfort your child, creating an ideal read time environment.Polar Cuddle Cub features:Eco-friendly anti-bacterial Soy-based fabricVibration device with 2 gentle rhythmic optionsTime and hug activation optionsMemory foam hands and feetStorybook and adoption certificate2 AA batteries includedIdeal for ages 3 and upPolar Cuddle Cub is part of the Cloud B Endangered Species Series which helps bring awareness to our animal friends who need our attention. A portion of your purchase will go to an international wildlife organization.